Carnegie Mellon University (CMU) is a global research university with more than 12,000 students, 95,000 alumni, and 5,000 faculties and staff. CMU has been a birthplace of innovation since its founding in 1900. 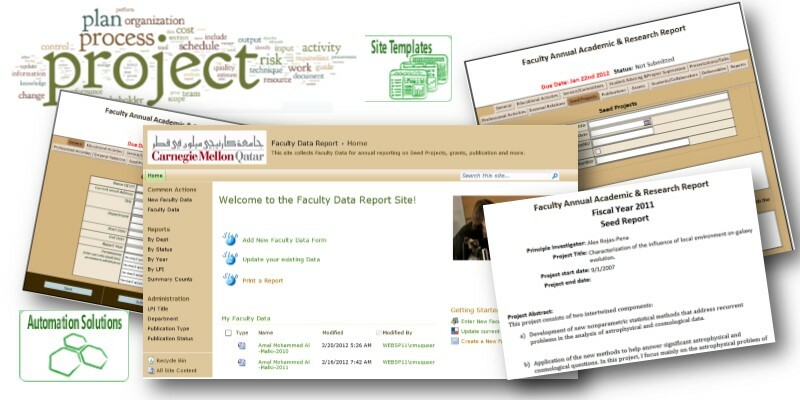 CMU's Qatar campus engaged Simple SharePoint for assistance. Carnegie Mellon was having a challenge with tracking projects underway by their professors. They contacted SimpleSharePoint to inquire if a document management system combined with InfoPath forms could provide business process automation. It was a complex logic problem that required Infopath forms to be flexible and have an unlimited number of project entries via some embedded repeating form components. Dashboards to make process automation was required. After the initial assessment of their needs and review of some mockup prototypes of forms, we engaged collaboratively. We built a forms dashboard that could have repeating tables and then provide the results in aggregated form so that people could see where they were within the process. We also wrote a user guide pretty much baked it into the interface so that it was a very simple to use solution. Customized permissions to secure forms and reports based on Admin rights and users listed in forms. Saves time, prevented mistakes, and avoided extra costs. The end result of this content management system that was tied in with MS Word, Info path forms, and dashboards was a great deal of business process automation, saved time, and increased the accuracy of reporting which saved expenses.